Poulet Sauté Sauce Bercy – Friday nights meals are prepared from orchestrated sweeps of the pantry and fridge. Sometimes, all those leftovers and random ingredients come together to create a restaurant style dinner. Tonight, the main ingredient is chicken in the form of split boneless and skinless breasts. For Mom, I bought some boneless and skinless thighs to prepare the same way. She should have two meals from the portion I put away in the freezer. How often does this happen to you? You purchase a family pack of boneless and skinless chicken breasts at a terrific price with a specific recipe in mind. Life gets the upper hand and changes everything for you. The recipe destined to be a crowd pleaser becomes a dinner for two! I took two of the huge chicken breasts and split them in half crosswise with a very sharp knife. This allows for more even cooking when the piece is uneven. Buy these gloves to stay safe with certain kitchen tools such as sharp chef knives and mandoline slicers. There have been times when I’ve cut myself so quickly and effortlessly that I never even noticed or felt it. Until later. Usually, I pound the chicken pieces flat when I make Chicken Parmesan cutlets but this time, I simply cut them in half, placed the pieces on a large oval platter then sprinkled them with the pan searing flour. 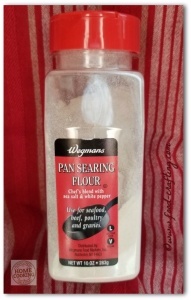 Wegmans® pan searing flour is a fine textured flour that pours like salt. Instead of putting the chicken in a zip lock type bag, adding flour and shaking, you will be more successful if you simply sprinkle it on as if you were seasoning the meat. Be aware that it is quickly absorbed into any remaining liquid on the chicken. You may have to turn and coat the pieces more than once to get a good even coating of flour. This type of flour is perfect when you want a light coating that does not cake up while frying or sautéeing. It turns golden brown very quickly allowing the flavor of other seasonings and sauces to dominate. We’re not talking Shake N Bake® coating here – the sauce is the star. Sauce Bercy is a combination sauce. Its base is a Sauce Velouté “mother sauce” flavored by the shallot infused Bercy sauce. There are five mother sauces in French cuisine and the Velouté is one sauce we should all learn to make. It is the base for so many other delectable sauces. There are literally hundreds of sauces in [popup_product]French cuisine[/popup_product] but nearly all are based on these mother sauces. White roux as a base is made even tastier with the addition of cream or more butter! A dark roux base is made using the pan drippings from pan fried pork or steak instead of butter. The flour is allowed to attain a certain color by carefully watching it as it cooks. It needs to be stirred constantly as it takes on a golden color and becomes as dark as you need it to be – without burning! White Roux: Cooking the flour and melted butter for a couple minutes removes the unpleasant chalky flavor of flour. Stir constantly and be careful not to let take on any color. This “white” roux is the base for all white sauces. You can prepare it ahead of time but for this recipe, I prepared both the roux and the Bercy at the same time. The name sounds fancy but the sauce is easy to make. Bercy is a Paris neighborhood reknowned for its wine storehouses. 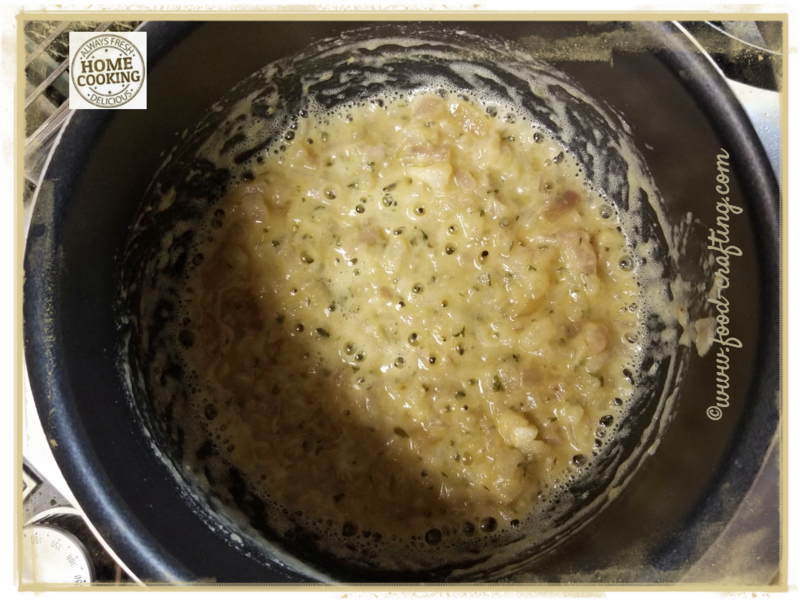 Sauce Bercy is more readily associated with fish but this white sauce tastes fabulous on chicken pieces because the velouté portion of this sauce is made with rich chicken stock. 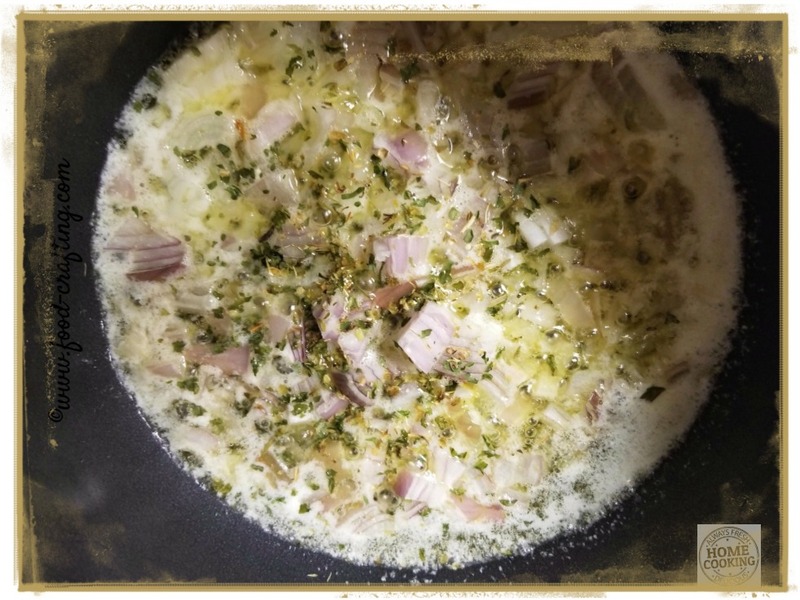 The sauce for this dish is actually a combination of two sauces: the classic Velouté is prepared first then combined with a reduction of the shallots and white wine Bercy sauce. 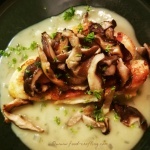 A thick and creamy white wine and shallots sauce for sautéed chicken. 1/3 cup Wondra® or Wegmans® Pan Searing flour. Salt and pepper to taste or chicken base. I seasoned this sauce with chicken base which gave it a golden color. Over low heat, melt the butter in a heavy bottom sauce pan. Add diced shallots – sauté until translucent or 3 to 5 minutes. Add thyme and some of the parsley. Sauté over low heat a couple more minutes. Add flour and stir quickly to combine well with the melted butter and shallots. Return to the burner and over low heat, allow the mixture to bubble up again, stirring constantly. Do not let it begin to take on color. You are making a White Roux not a “Cajun roux” – you just want to remove the flour taste from the sauce. Add the cold chicken stock and stir to combine well. Then add the white wine and stir to combine. It will start to thicken rather quickly. Adjust seasoning at this point. This is where I add this chicken base or this one to give the sauce some color.and a burst of chicken flavor. I did mention at the beginning of the post that this was a fridge clearing type of meal. And in my fridge, I found two packs of fresh shitake mushrooms destined for that other recipe! 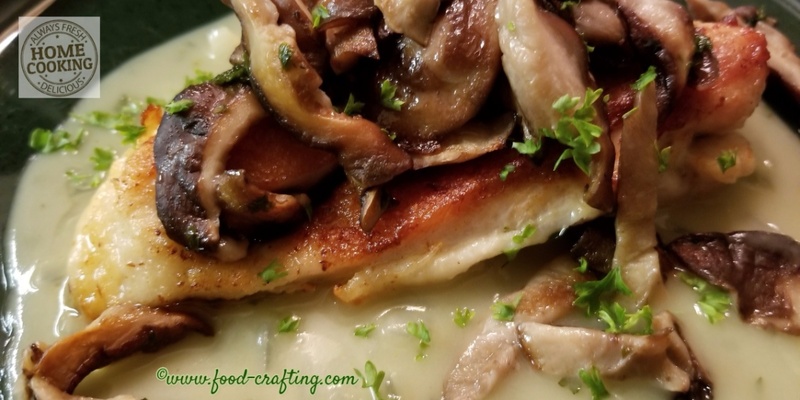 Mushrooms were a perfect topping for the sautéed chicken pieces! Easy, peasy side dish. In a small frying pan, melt a tablespoon of butter over medium high heat. 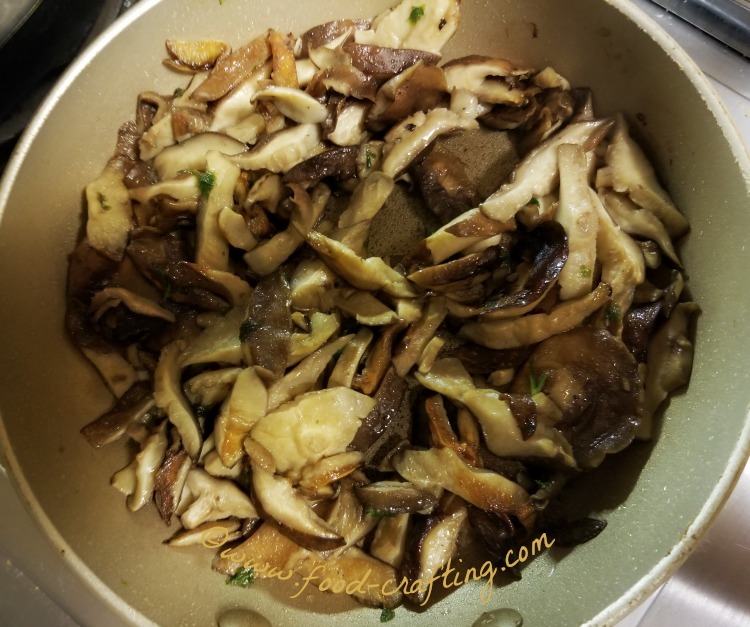 Add the sliced mushrooms to the pan and sauté until all the rendered liquid has evaporated and the mushrooms are golden brown. Season lightly with salt, pepper and some chopped parsley. I wanted every bite of the Poulet Sauté Sauce Bercy to be coated with the sauce so I ladled it on the plate first. Next came the sautéed chicken. I then topped the chicken breast with the mushrooms. 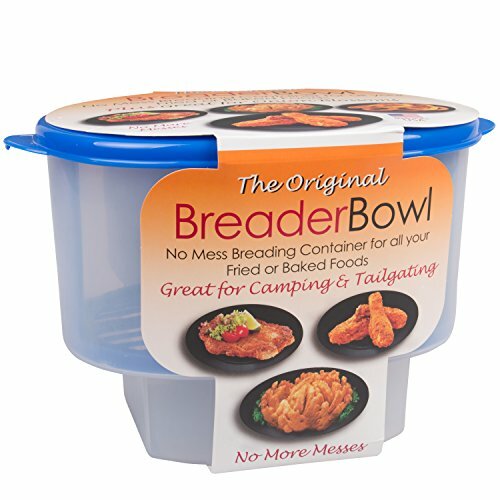 Planning a big celebratory meal? Try a classic French palate cleanser – the Trou Normand. 2 What Are Mother Sauces? 3 What Is A Roux? 6 Wondering About The Shrooms? 8 The Topic Is Chicken! Posts contain affiliate links so readers can locate resources mentioned in recipes & articles. Merci.